Neutrogena Healthy Skin Blush is a new permanent range of blush shades enriched with Vitamin C to give skin a healthy flush of color. Neutrogena already has Healthy Skin Custom Glow Blush & Bronzer which is still available and apparently is amazing as it gets rave reviews (I’ve never tried it) but the brand kinda lacks single shades of blush so the Healthy Skin Blush is a welcome addition to their permanent collection of color cosmetics. Neutrogena Healthy Skin Blush ($7.99) is available is available in three shade selections and is set up in a display that also features Neutrogena Healthy Skin Blends Natural Radiance Bronzer, Neutrogena Healthy Skin Blends Sheer Highlighting Blush, and Neutrogena Healthy Skin Blends Translucent Oil-Control Powder. I find both the colors and the packaging very appealing. 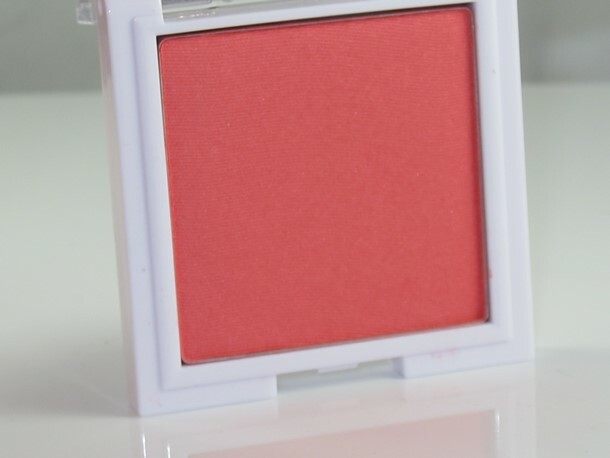 These are tiny square compacts that house 0.19 oz of blush. They are small but they pack a good deal of product and I like the size as they will store and travel easily. I also thought the shades were quite popping and pretty! I’m actually not a great lover of the formula sadly. Neutrogena makes them sound incredible with advertising that promises, “to enhance skin’s healthy glow”, this is potentially misleading as it makes the blushes sound glow-y or luminous which they are not. Both shades I tried were a satin blush with a slightly powdery, chalky, dry consistency. I thought they blended out a little patchy and the color sorta had a flat finish that looked matte on my cheeks. The colors although pretty in the pan looked a little clowny on my cheeks so beware during application as they are quite pigmented! This combined with the texture somehow creates a little bit of a messy application that looks uneven and too bright. Wear time felt might short to me for something this bright and pigmented….! I saw fading at around the five hour mark which isn’t common for me as I can typically get eight hours or more out of my blush wear. They are pretty but Neutrogena Healthy Skin Blush just wasn’t a formula I loved sadly. Neutrogena Healthy Skin Blush is popping up now at drugstores. Vibrant Healthy is really pretty on you! I think I’ll pass after reading your review, although I like the colors. Chalky isn’t appealing. the color and packaging remind me of the Victoria secret blushes that came out a while ago. I got those in every color because I loved the color and formula and I think you did too. they both look lovely on you, but too bad the formula is no good. PS what is that gorgeous hot pink lippie in your 2nd pic? I love it!